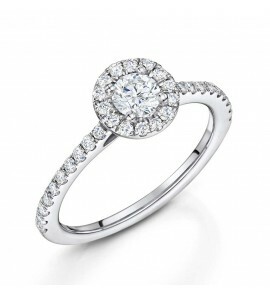 18ct white gold Diamond halo ring 0.26ct. Halo ring set with one round brilliant diamond 0.20ct surrounded by halo of 12 brilliant diamonds with total carat weight of 0.26ct. Hallmarked 750 18ct white gold shank with 18ct white gold head. Accompanied by beautiful Antwerp Diamond Company packaging. ..
Halo ring set with one round brilliant diamond 0.23ct surrounded by halo of 12 brilliant diamonds with total carat weight of 0.43ct. Hallmarked 750 18ct white gold shank with 18ct white gold head. ..
Halo ring set with one round brilliant diamond surrounded by halo of 12 brilliant diamonds with total carat weight of 0.52ct. Hallmarked 750 18ct white gold shank with 18ct white gold head. 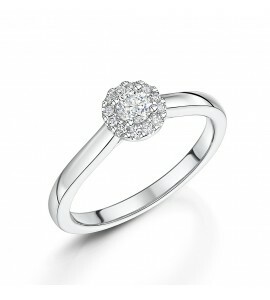 ..
18ct white gold diamond halo ring 0.63ct. Halo ring set with one round brilliant diamond surrounded by a halo of 12 brilliant diamonds with total diamond weight of 0.63ct. Hallmarked 18ct white gold shank. 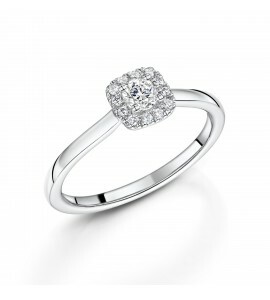 ..
Diamond halo ring set with a 0.19ct brilliant cut diamond surrounded by a halo of 12 brilliant cut diamonds. Hallmarked 750 8ct white gold shank. 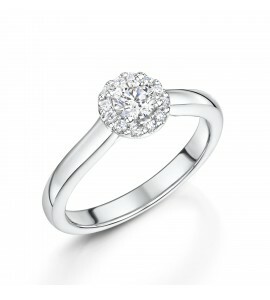 The total carat weight of ring is 0.26ct. ..
Diamond halo ring set with a 0.32ct brilliant cut diamond surrounded by a halo of 12 brilliant cut diamonds. Hallmarked 750 8ct white gold shank. 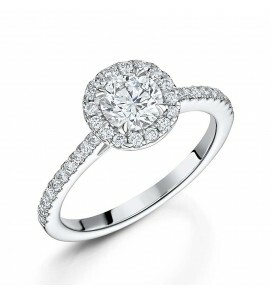 The total carat weight of ring is 0.42ct. ..
Diamond engagement ring is set with a 0.30ct brilliant cut diamond surrounded by a halo of brilliant cut diamonds. Hallmarked 950 platinum diamond shank set with brilliant cut diamonds with a combined weight of 0.30ct and with platinum four claw head. 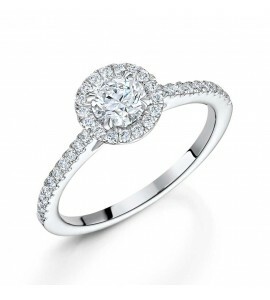 This certified diamond ring comes with a IGI Dia..
Diamond engagement ring is set with a 0.35ct brilliant cut diamond surrounded by a halo of brilliant cut diamonds. Hallmarked 950 platinum diamond shank set with brilliant cut diamonds with a combined weight of 0.50ct and with platinum four claw head. This certified diamond ring comes with a IGI Dia..
Diamond engagement ring is set with a 0.35ct brilliant cut diamond surrounded by a halo of brilliant cut diamonds. Hallmarked 950 platinum diamond shank set with brilliant cut diamonds with a combined weight of 0.70ct and with platinum four claw head. This certified diamond ring comes with a GIA Dia..